This entry was posted in all, Photography and tagged kibble, no tail to chase, woof. Bookmark the permalink. What a cutie patootie! Who is this handsome devil? No idea. 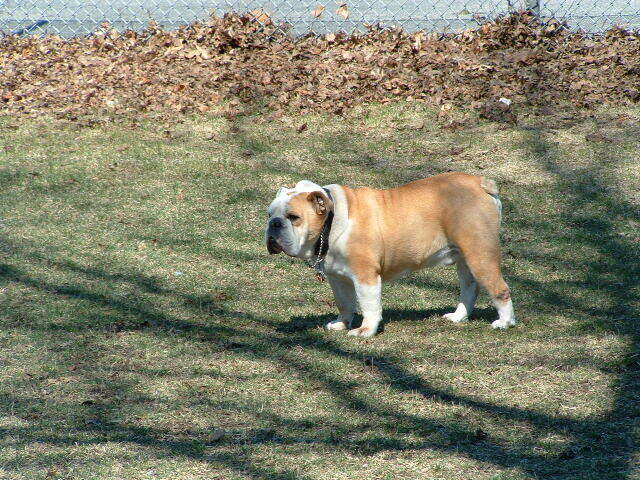 Saw this Winston Churchill doppelganger in a dog park in Toronto and took the pic. I wondered if he was looking for a cigar. Believe in the tenacity of the Canadian winter, ericaatje. Outside my window all is white and it is snowing with a temperature of -10 C. That photo was taken in the early summer. I still remember the winters of my early childhood in Holland with pleasure. Skating on a frozen pond in Meerkerk, the little hut where hot chocolate was sold and the leather straps by which the blades were lashed to my shoes. That was around 1953 or 4, prior to moving to Canada where the icy grip is constant from December to April. You lived in Holland. How nice to talk to you! Then the winters are worse over there in Canada! And we thought it was bad over here. I hope your summer is as warm and pleasant as ours is forecast to be once this unpleasant and lengthy winter finally meets its demise. Living in Ontario’s farmland, an area which has many Dutch families doing very well indeed, I’m constantly reminded of life in Holland, even though, with the exception of a little travel, I’ve not much direct contact anymore. There are also shops here which specifically sell imported Dutch products, so I am able to have my Deventer Koek, appelstroop, various cheeses and sausages. Holland is never distant because of that. Also, you might be tickled to know that the special relationship between Canada and Holland is as close as it ever was since WWII.